The festivals in Salento are a separate chapter of the countless events that punctuate the cultural landscape of our region. The Patron Saint was the only public event that regularly recurred in every town or hamlet, small or large, with huge expectations on the part of all citizens, in every category and social able to demonstrate the immense devotion to the patron and the ‘ affection. Lecce celebrates its patron saints, Oronzo, Giusto and Fortunato with a series of events planned to run 24 to 26 August. The city wears the clothes of the party, especially the historical center. Piazza Sant’Oronzo, and all the roads that converge here, are decorated with lights, whose art, in the Salento, is among the most prestigious in the world. Sant’Oronzo, born and raised in Salento in the first decades after the death of Christ, is the beloved patron saint of Lecce as well as first bishop of the city. In his honor by the locals they eat every year on the dish consists of a free-range cockerel, and the classic recipes to prepare this typical Rooster, call “addrhuzzu te Santu Ronzu” are: baked with potatoes cut into slices, stewed with tomato sauce or sautéed with rosemary and bay leaves. 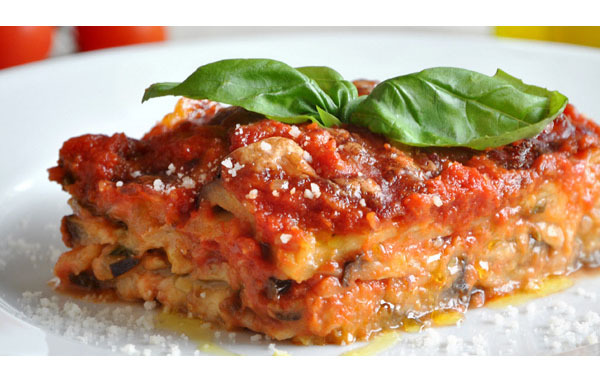 Unmissable in this day is also the tasty Parmigiana, prepared with seasonal eggplant, at the peak of their goodness, being the summer period where you will find the best quality eggplant. 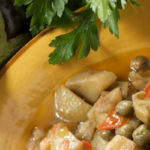 Discover all the secrets of Gianna’s recipe in the following article! Let’s celebrate together the feast of the Patron Saints with a fun and traditional cooking class in the heart of the Baroque Leccese, a few steps from the Duomo and Piazza Sant’Oronzo. We will walk along the illuminated streets, and once at school we’ll taste together ancient and true atmosphere of the most important celebration of the year for our beautiful city!